/shopDVD copies of the new documentary on the life of Rhode Island visionary entrepreneur, Austin T. Levy, will be released to the general public on Monday, October 3rd. The 55-minute film includes the story of Levy's life in Rhode Island and the Bahamas and his philanthropy in education, health care, and the communities where he lived and worked. The DVD also includes an additional hour of interviews with the participants and stars of the film. Cost, including first class mailing, is $23.45. 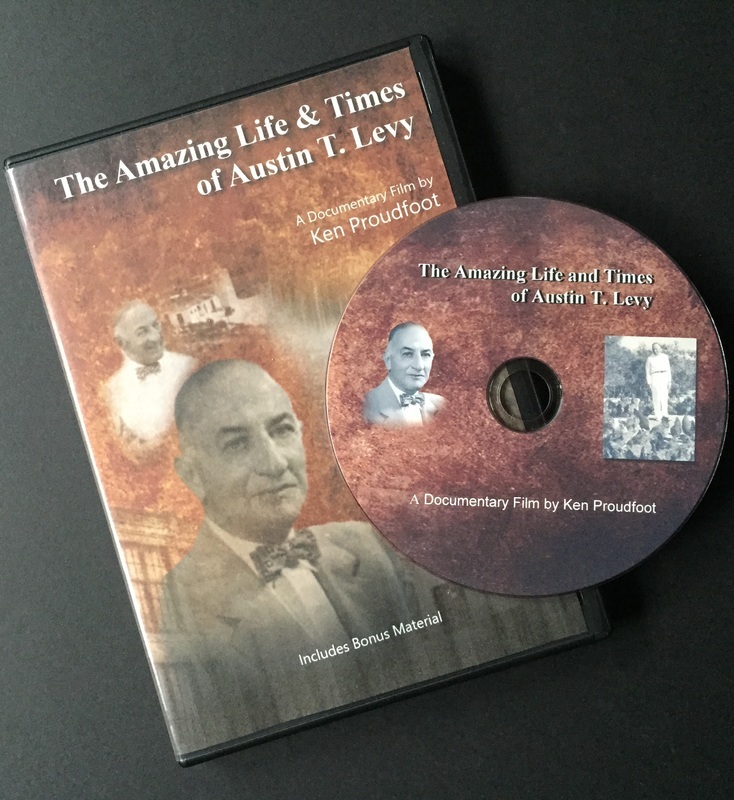 We are pleased to announce the World Premiere of the completed documentary, "The Amazing Life & Times of Austin T. Levy," on Saturday evening, 7:00 pm, October 1, 2016 at the Assembly Theatre on East Avenue in the village of Harrisville, Rhode Island. The film's premiere will take place in a most fitting venue. The Assembly Theatre was a gift of Austin T. & June Rockwell Levy to the people of Burrillville in 1933. A second showing has been added for Sunday, 1 pm, October 2, 2016 at The Assembly Theatre. Call for tickets now: 401-568-8449. 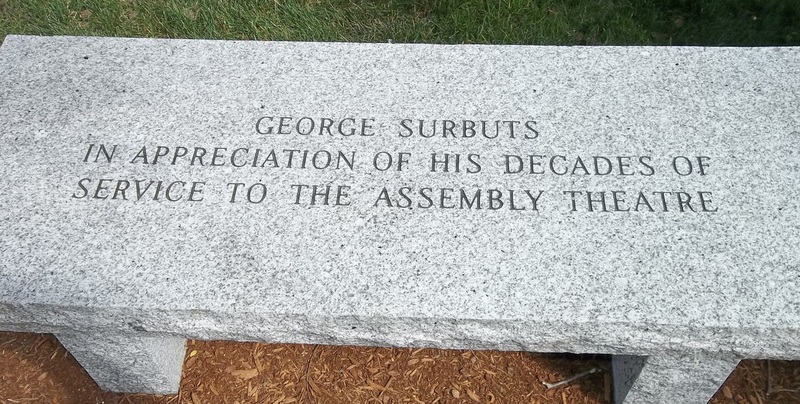 ​All ticket sales benefit the Burrillville Historical & Preservation Society. AUSTIN T. LEVY FILM TRAILER IS READY! This has been a busy month and no one has been busier that the film's Director of Photography, Jim Karpeichik. During the past few weeks he assembled the pieces of film and sound and story line to create a wonderful 4-minute film trailer which is now posted on YouTube and has garnered more than 550 views in just its first three days! I hope you will check it out and let me know your thoughts. The journey to discovering the past often leads to surprises. Such was my discovery last week of a broken-down, but not completely swept away granite dam hidden under the brambles and a thicket of trees near the center of Pascoag, RI. Pascoag is a key village in the northwest Rhode Island Town of Burrillville and a close neighbor to Harrisville. Both communities held a special place in the hearts and lives of Austin T. and June Rockwell Levy. The story related to me about the dam is that it was part of a former textile mill (the mill was not owned by Levy) that hugged the stream bank in an earlier time. The mill is long gone, but the dam's remnants remain. Yes, there is a Levy connection. Today the offices and clinic of WellOne occupy this property once owned by the Levy's and given to the original Burrillville District Nursing Association, a predecessor to WellOne. Here's the hidden gem of a dam. Notice that in spite of the passing of time, the disappearance of the mill, and misplaced granite stones, the water keeps rolling along. We had the opportunity today to interview Peter Bancroft, President and CEO of WellOne in Pascoag, RI. 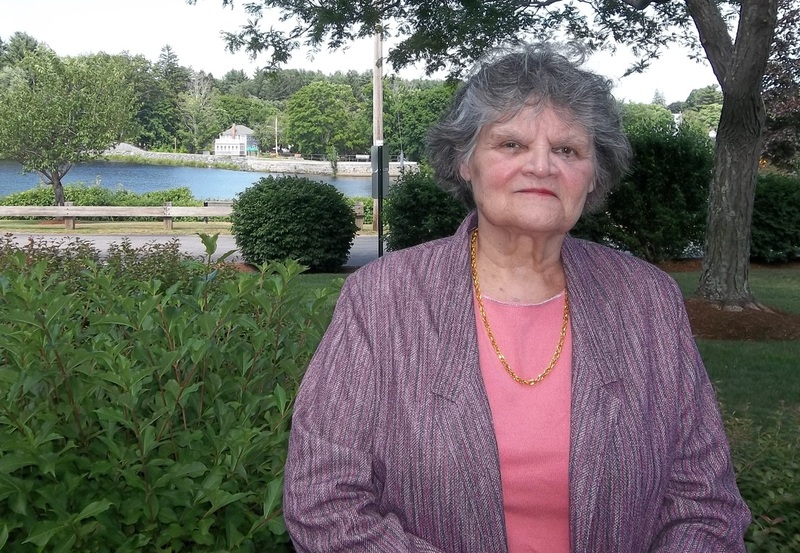 This organization is the most recent incarnation of the Burrillville District Nursing Association. June Rockwell Levy played a key role in the organization as the President of the Board of Directors for 51 years, beginning in 1921. The group's headquarters is located on a piece of land donated by the Levy's and the first building was funded by the June Rockwell Levy Foundation. Across the street is the Pascoag Post Office, also funded and donated to the U.S. Government by the June Rockwell Levy Foundation. We had our first day of filming this past week. On July 11th, we spent the day in the history room at the Jesse Smith Memorial Library with Research Librarian Linda Rivet capturing more than 100 images, including photos, news articles, cards, and documents that will help us tell the story of Austin T. Levy and his amazing life. More news and photos are posted regularly on the Austin T. Levy Film page on Facebook. The first of a 4-part series of videos covering my presentation to the members of the Bahamas Historical Society appears here. This talk took place on Thursday, May 29th at 6 pm. It was followed by a question and answer period. Dinner followed with several members of the Society at the exquisite Cafe Matisse in Nassau, including (left to right above), Philip Hillier, Gerri Hillier, Ken Proudfoot, Paul Aranha, and Kayla Edwards. Here is is a link to Part One of my presentation, The Amazing Life & Times of Austin T. Levy. Flying back to Nassau (New Providence island) in the Bahamas this morning to continue research on Austin T. Levy's amazing work on the island of Eleuthera. 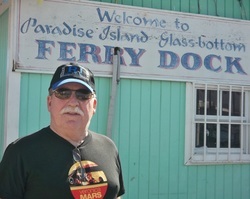 On Thursday, May 29th, I will be making a presentation to the Bahamas Historical Society about the upcoming book and documentary on Levy's life. For more news, see Austin T. levy Film Facebook page. Barry Mechanic, the host of "The Mechanics of Business" on 1240-AM WOON radio in Woonsocket, RI, invited me on his Saturday morning show to talk a little bit about Austin T. Levy, his unique business and life philosophies, and some news about our process for making a documentary about his life. We discussed Levy's focus on business and the communities where his textile mills were located. 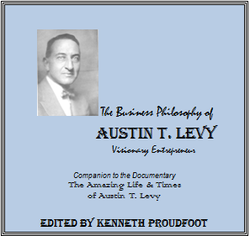 Many of his ideas and statements are being collected and edited in a small book on The Business Philosophy of Austin T. Levy. I'll have more information on this soon. Meanwhile, I've attached an mp3 of the radio program with Barry Mechanic. Please let me know your thoughts or feedback about this program. Feel free to share this podcast with your friends and colleagues. Marjorie "Margie" Rhodes allowed us to visit her home in Harrisville on Saturday, October 12th to share her stories of life in Harrisville in the 1900's and to tell us more about Austin T. Levy. Linda Rivet, Research Librarian at the Jesse Smith Memorial Library, conducted the interview with Mrs. Rhodes, while I managed the lights and video camera. We were able to spend an hour hearing her first person memories of that time and the importance of Mr. Levy to this community. 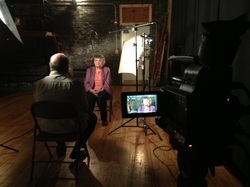 Watch for this interview and more in a 30-minute introductory film that will run on Rhode Island public television in late December, 2013. Margie Rhodes (above) shared a few of her stories about Austin T. Levy, his wife, June Rockwell Levy, and life in Harrisville in the early to mid 1900's. 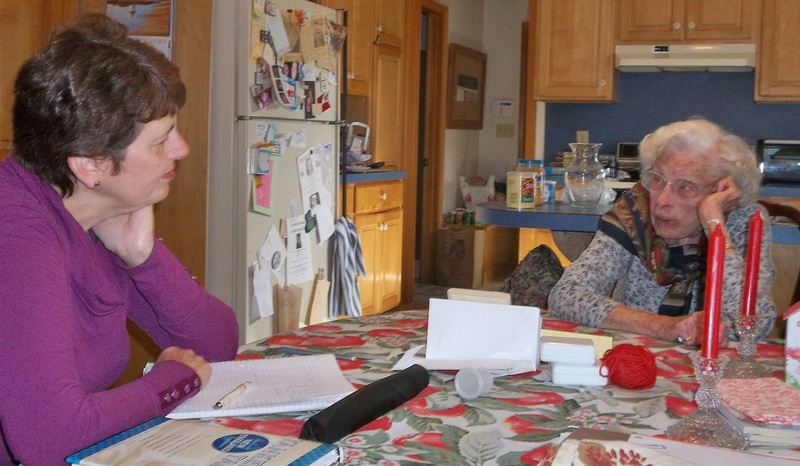 In the photo below, Linda Rivet (left) interviews and listens to Mrs. Rhodes. 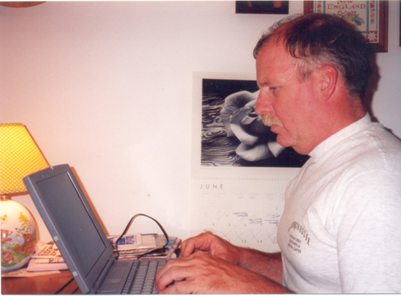 Kenneth Proudfoot writes, photographs, films, authors, markets, creates, and makes things happen. He grew up in Greece, New York. He lived in Peru and Chile for 4 years as a Peace Corps volunteer. He was the founding director of the Larry Friedman International Center for Entrepreneurship at Johnson & Wales University. He has worked and traveled in 50 countries. He is fluent in Spanish. He lives and works in Rhode Island.